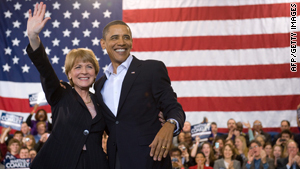 President Obama campaigns with Democratic Senate candidate Martha Coakley on Sunday in Massachusetts. (CNN) -- Faced with the once-unthinkable prospect of losing the Massachusetts Senate race, Democratic officials on Capitol Hill are quietly talking about options for passing health care reform without that critical 60th Senate vote. Top White House aides insist they are not engaging in any talk of contingency plans, because they believe Democrat Martha Coakley will beat Republican Scott Brown in Tuesday's crucial Senate battle. "We are not having any discussions like that," White House spokesman Bill Burton told CNN. "We believe she is going to win." Asked about potential contingency plans as Air Force One returned to the Washington area after President Obama's Sunday campaign rally for Coakley in Boston, White House Press Secretary Robert Gibbs insisted to reporters the plan is to still pass health care reform with 60 votes. "We think Coakley will win this race," Gibbs said. Pass health care reform before Scott Brown is seated. But multiple Democratic sources say this is unlikely. Even if House and Senate Democrats could reach a deal to meld their bills and pass them in the next couple of weeks -- a big if -- there would be a huge outcry from not only Republicans, but also an increasingly distrustful public. For that reason, one senior Democratic source says some Democratic lawmakers who voted yes last time have already warned they would vote no if health care is voted on in advance of any swearing in of Brown. The House passes the Senate health care bill. Democratic sources also call this extremely unlikely, because House Speaker Nancy Pelosi likely wouldn't have the votes to pass it. Many House Democrats have major differences with several provisions in the Senate bill, especially the way the Senate structured a tax on high-cost insurance plans. Revisit the idea of trying to push health care through the Senate with only 51 votes, a simple majority. But to do that, Democrats would have to use a process known as reconciliation, which presents technical and procedural issues that would delay the process for a long time, and Democrats are eager to put the health care debate behind them and move onto economic issues such as job creation as soon as possible this election year. Try once again to get moderate Maine Republican Olympia Snowe's vote. They could try for a compromise health reform plan with the independent-minded Republican, but multiple Democratic sources say they believe that is unlikely now. Their health care overhaul dies. Although some Democrats are not ruling out this possibility, numerous top Democrats say not passing a health care bill for the president to sign is unthinkable after he put so much political capital into passing a reform bill, and congressional Democrats spent much of last year working on it.